Elevated par 4. Push your drive right and you’re in the lake. Pull it left and you will either be OB or in the sand trap. Elevated par 4. Must align shot slightly left of those trees in the middle. 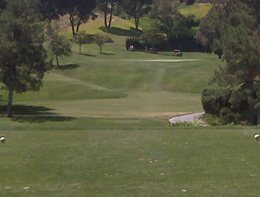 A long drive left will put you up against some large pepper trees making your second shot to the green almost impossible. 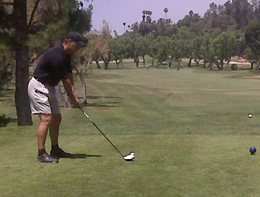 Many tee off with mid irons or utility wood making for a nice approach. Big hitters go for the green in one by hitting over the trees in the middle. Need to carry the hill for a descent drive. Trouble in the trees if you push your ball right. Ditch lines the right side of the fairway. Pull the ball left and you’re in the trees. Long hitters go for the green in two. 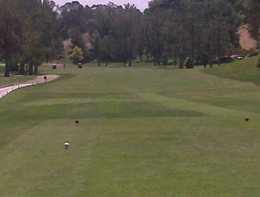 Many players hit their second shot over the ditch in two, though there is a good bailout area to the left of the ditch. Elevated green. Surrounded by traps. Sloping green right to left with a flatter landing red pin on the right. Go long and it’s a difficult pitch down onto the green as the slope runs away from the hole. Long par 4 typically into the wind most afternoons. Pull it left and you are buried in the trees. OB right. Requires a long straight drive to reach green in two. A par 5 from the Red Tee. Blue and White Tees you hit over the hedge and street to a blind hole over the hill. 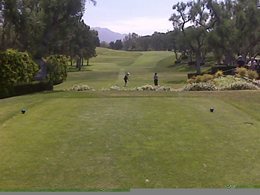 Long hitters hit over the hill then have a short approach to the green in two. 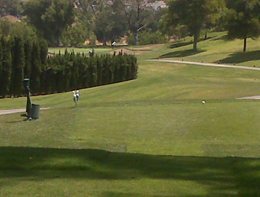 Most players that don’t clear the hill have a difficult elevated second shot hitting down onto the green. Pull your drive left and you are in thick grass with a huge pine tree to contend with at the crest of the hill. OB right. 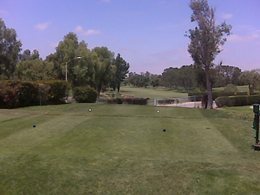 Long par 3 from the Blue Tees to a slightly elevated green. Pull it left and you are buried in the trees. Extremely fast green sloping from back to front. Leave the ball below the hole for a nice uphill putt. You can rip your driver off this hole. 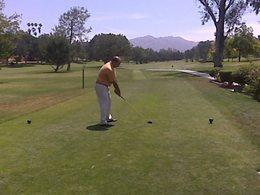 Ditch crosses the fairway around 300 yards out. Lake does not come into play for longer hitters. Super long hitters may wish to hit a 3-wood so they won’t hit into the ditch. Pull it left and your buried in the trees. Push it right and your in the lake for most players. Requires a long straight drive to reach the green in two. OB right. Ditch and trees left. Fast green sloping from back to front. Long par 3 if blues tees are all the way back. OB right. Trees left. 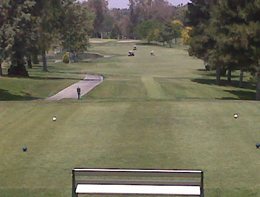 Long uphill par 4. Water left, OB right. 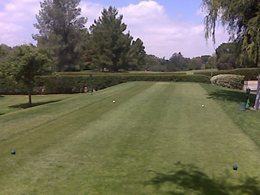 One of the toughest putting greens on the course. 2 tiers with a severe ridge in the middle of the green. Yellow pin be sure to hit it longer to get over the ridge. Super fast putt from back to front. Leave your ball below the hole if possible on this green. There have been times when a tapped downhill putt won’t stop rolling until it gets off the green. Elevated tees hitting down to green. Pull it left and you may find your ball 50 feet below the green. OB right. 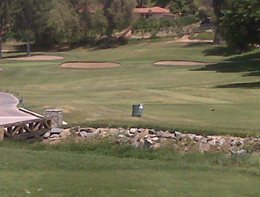 Beautiful view of the hole from the severely elevated Red tee box (pictured). Slightly less elevated Blue and White tee are back on the left (not pictured). Ditch is reachable straight away for long hitters from the Blue or White with a chosen few electing to hit over the ditch in one. Elevated three tier green sloping left to right. Green is well protected in front by a very large sand trap. 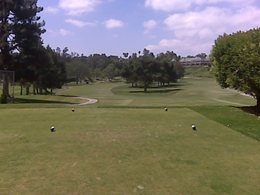 Eucalyptus trees line the left and right side of the fairway. OB right. Grip it and rip it. Long hitters go for this green in two. Sand trap reachable on right for long hitter’s drive. Pull drive left and you are in the trees. Green is hidden by mound of sand traps and trees. Many play short of the trees in two, then hit over the sand traps and onto the green in three. 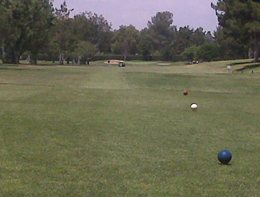 Some choose to hit their second shot in the bailout area over the ditch left. This then gives a clear view of the green for their third shot. 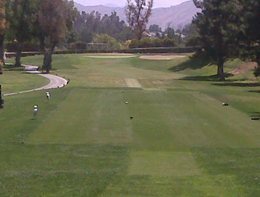 Though the tee box looks elevated for Blue and White, the green is roughly the same height. Red tees below have to hit up to a blind green. Elevated Blue and White tees hit over the street. Ditch lines the left side of the fairway. Super long hitters will go for this green in two which is risky as the ditch crosses over in front of the green. Push your drive right and you are in the trees. Victoria Club © 2019. All Rights Reserved.